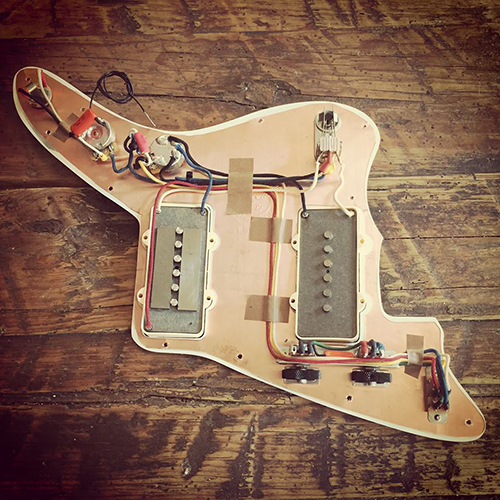 Use this page to order a prewired Jazzmaster assembly with JM180 Wiring. Select from the options below and then add the assembly to your basket. You will find information about each option is at the bottom of the page. The initial price of every prewired assembly is $0, but after you add it your basket the actual price will be calculated. You can view the total price by viewing your basket contents. Introducing a totally cool mod for you Jazzmaster® that requires absolutely no visual changes to your instrument. Your pickup will have 2 modes: normal gain and high gain! No batteries, no preamps, just 2 version of a pickup in one. Curtis Novak's amazing JM180 pickup is built on his very popular JM-90 platform, but takes this great pickup to a whole new level. 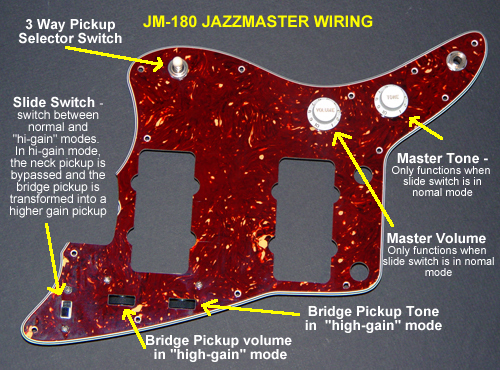 Like with his JM-90 this will fit in a standard Jazzmaster pickup route. Here's the deal. I can't tell you how many serious Jazzmaster players have told me they NEVER use the upper rhythm, it is just too dark, or it sounds like someone stuffed cotton in your ears... So Curt got the idea of this tapped JM pickup and we worked together to redesign the wiring for the upper rhythm circuit converting it into a high gain lead circuit with its own separate volume and tone. So when you slide the switch to the upper circuit you will get the Full JM-180. Curt came up with the name JM-180 because it is 2 full JM-90's in one, but also it does a complete 180 on the dark rhythm circuit making it a over driven lead circuit, without the need of an overdrive pedal. Please note we are using special pots and caps for this circuit not available from the usual guitar parts suppliers. Curt and I agreed to get the best tone out of the JM180 pickup, we should not use the standard 1M and 50K pots normally found in the upper circuit. After much testing we both agreed the optimal value would be 500K audio taper for the volume, and 500K linear taper for the tone but we needed these pots to fit the upper circuit's mounting bracket and have a solid shaft to take the roller knobs. Luckily we were able to score the perfect pots that have solid shafts are are the exact same size as your traditional jazzmaster mini-pots!! Special Cap for the famous Clapton Woman Tone! We are using a special value orange drop capacitor that will give you that highly sought after and famous Clapton Woman Tone that works perfectly for the high-gain circuit. The cap value is lower than normal. 022 uf and will enable you to rotate your roller tone knob fully counterclockwise and it will not sound muddy, but instead will give you a really creamy distortion when pushing the amp to overdrive. Please note the upper circuit is totally vintage and still uses a .033 uf capacitor. Just like all our other assemblies, these prewired Jazzmaster® assemblies use only the finest electronic components, and are even 'period correct' with regards to the color coding of the vintage style cloth wire. All components are treated with Caig Deoxit for long trouble free use. 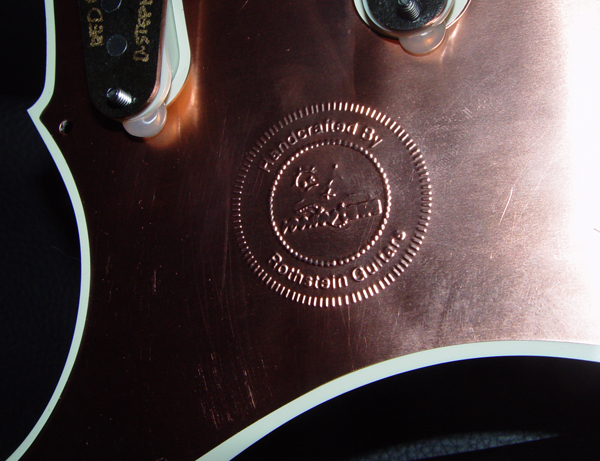 They feature our custom made copper shields, only available at Rothstein Guitars. Fair warning, these will not be inexpensive but they will be of the highest quality you can find and worth every penny. Enough with talking about it Here are 2 different sound files switching between the JM-90 and the JM-180. The first part is the JM-90 coil tap on the lower circuit, the second is the full JM-180 on the upper circuit. 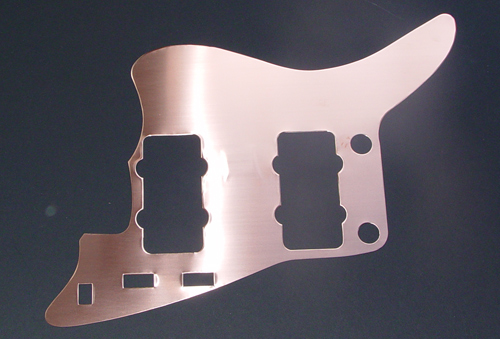 If you want killer Jazzmaster pickups, then you must check out Curtis Novak pickups. These are amazingly toneful pickups, and Curt offers a wide array of options. Rothstein Guitars is proud to be the only AUTHORIZED DEALER for Curtis Novak pickups. You are welcome to mix and match any neck pickups with the JM180 Bridge pickup, however we recommend only Curt's single coil options so those are the only one's you see in the list. 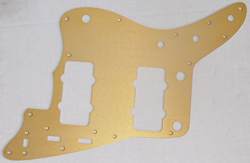 Telecaster® Bridge pickup made for the Jazzmaster form factor. Jazzmaster® / with Strat magnets and fatter wire. A .033 MDF SBE Orange Drop capacitors will be used by default at no extra charge, or for an upcharge you may select between Uptone Audio Muscaps, NOS John E. Fast Paper in Oil caps, and VH Audio V-Cap TFTF Teflon Film and Foil capacitors. The price will vary depending upon which capacitor you select. 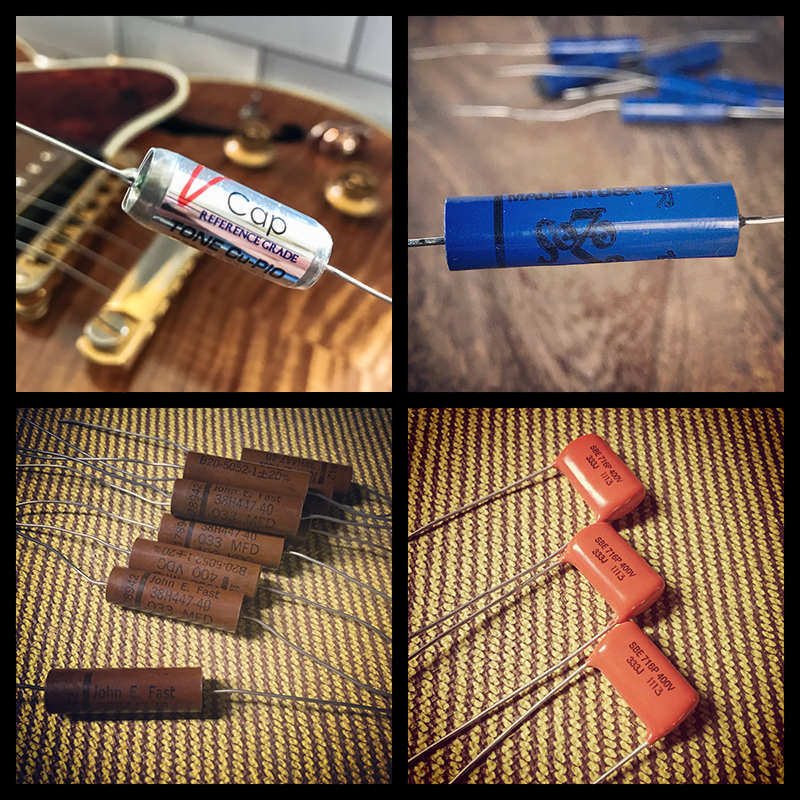 Read about our capacitor choices here. The capacitor upgrade option applies to the lead circuit only. A .022 MFD Orange Drop capacitor will be used in the rhythm circuit. Recently we started offering a modification to our original JM180 wiring, which we call JM180-X. The only difference is that the upper circuit's tone pot is replaced with a bass-cut pot. As with the original JM180 wiring, the upper circuit controls are activated when the slide switch engages high-gain mode only. The bass cut control is a high pass filter, which enables you to dial out some of the lows. It works really well with the JM180 bridge pickup in high-gain mode, and is extremely useful to help overdriven sounds pop and cut through a mix. Please note the bass cut control will not be very noticeable with clean tones.